Sam Mullins of The Untitled Sam Mullins Project. BOTTOM LINE: Sensitive Sam shares some stories in this softhearted solo show. Sam Mullins has single-handedly put my ochlophobia into perspective. Faced from a young age with a panic disorder that found him fainting on stage and off, he nonetheless continued to pursue his passion for live performance. In what may be the definition of facing one's fears, his solo show finds him spinning mild-mannered tales without a nervous tick in sight. The stories range in theme from love at first sight, to theatrical mishaps, to aging parents. As is usually the case, listening to an actor talk about acting brought on a mean bout of my uncontrollable eye-rolling, but luckily I had regained focus for his version of the field of dreams (a redemption anecdote that's easy on the ears). 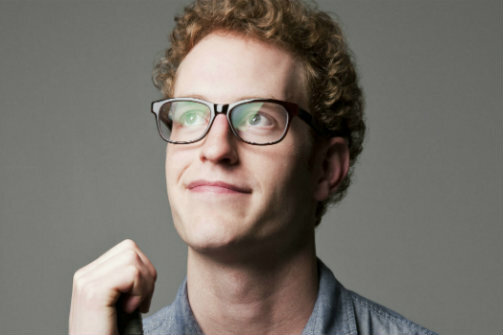 Throughout the show Mullins maintains a friendly conversational style suggesting the tone of podcasts like "This American Life" and storytelling forums like The Moth (both of which have featured his stories). While many solo performers take an aggressively theatrical approach to holding an audience captive, or lean on salty language to shock, Mullins instead heads in an affable family-friendly direction. So low-key is the presentation that it could be easy to let the mind wonder, but stay engaged and you may well relate to these simple slice-of-life stories. Overall, The Untitled Sam Mullins Project is a comfortable stroll in a likeable storyteller's sweetly sensitive shoes.